Colette "Our "Journey to Angkor Wat" tour has just finished and I wanted to partically mention our guide for the Vietnam section, Tuan. Tuan was exceptional. He has a caring nature looking after members of the group that were unwell at different times. His organisational skills and thorough attention to detail was appreciated by our party of 23. We always knew what to expect the next day in detail, someth..."
Start in Hanoi and end in Siem Reap! 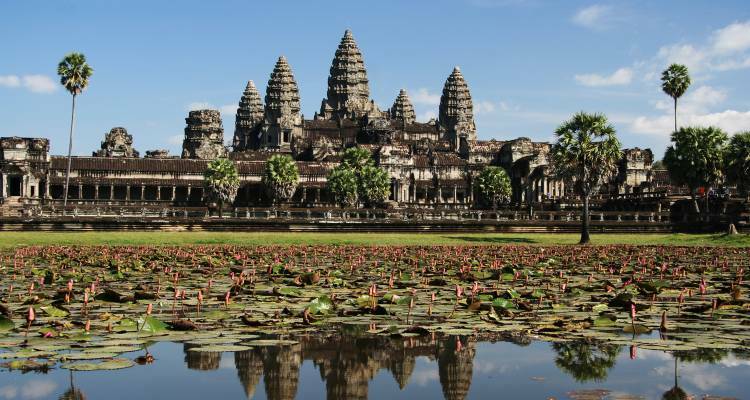 With the in-depth cultural tour Journey to Angkor Wat - 15 days, you have a 15 day tour package taking you from Hanoi to Siem Reap and through Hanoi, Vietnam and 11 other destinations in Asia. Journey to Angkor Wat - 15 days includes accommodation in a hotel as well as flights, an expert guide, meals, transport and more. We've just returned from our Journey to Angkor Wat tour. Faultless! Our tour guides were knowledgeable and couldn't do enough for us, the hotels were at least 4 star, the food was delicious and the company was brilliant. Can't recommend them highly enough! Due to the nature of the tour and the activities involved, children under the age of 16 years old are unable to join the tour. If you like some guidance of finding a more suited tour for your family, please contact our team of Travel Experts. What hotels do you use for the "Journey to Angkor Wat" Tour? What is the group size on this tour? The maximum group size for this particular tour is 24 people per group. TourRadar only requires a deposit of $99 to confirm this On The Go Tours booking. The remaining balance is then payable 65 days prior to the departure date. For any tour departing before 30 June 2019 the full payment of $2,795 is necessary. No additional cancellation fees! You can cancel the tour up to 65 days prior to the departure date and you will not need to pay the full amount of $2795 for Journey to Angkor Wat - 15 days, but the deposit of $99 is non-refundable. Covering a total distance of approx 2,255 km.